If you hand me a guitar, I’ll play the blues. That’s the place I automatically go. You may wonder how it is possible that Blues musicians which never played together before can enter the stage and start playing and jamming together without any rehearsals. Is this a secret magic? No! Once you know the basic structure of a Blues song, you can play with it also, playing the rhythm guitar or adding some fine solos. Please note: The old audio files used here as example were recorded directly from my guitar into the line-in of a sound card (see home recording). I played slow, so that you can follow with no problems. Nowadays they would sound better, but I think it’s better they sound like those from the beginner I was when recording, . Due to the African roots the rhythm was first. The songs used only a few, often only one “chord” all over the song. Later the influences of the western music (western doesn’t stand for country here but for the western hemisphere) introduced chord changes, but they where different to the existing musical forms. 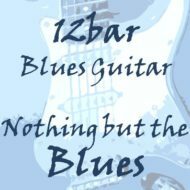 Something new was born, and after several changes and various forms (and some of them are still used) the 12 bar Blues (look at the URL) became the most popular blues form. 12 bar Blues means that the song is divided into 12 “bars” (or “measures”) with a given chord sequence. When playing, you repeat this form over and over for every verse until the song ends. There are also 8 bar (i.e. Key to the Highway from Layla), 16 bar and even 24 bar Blues (all forms can be divided by four! ), but the most frequent form is still the 12 bar Blues. All these Blues have again different substructures (i.e. chord changes), so finally we get over hundred different ways to play a Blues (more details are added directly to the specific songs). Sometimes there’s no strict form at all. This chord progression usually doesn’t change during the whole song. Usually – in Blues there are many exceptions! 4/4, 12/8 – what does this mean? Most Blues are played in 4/4 time (or beat), that means you have four (4) quarter notes (1/4 notes) per bar. Slow Blues is often played in 12/8 time, that means twelve (12) quavers (or “eighth notes”, 1/8) per bar. In the early stage of Blues music there were no guitar solos or even instrumentals, it was a vocal music. The guitar was used to to accompany the singer, who usually told a story about the bad life of the African-American people, often about himself. Most Blues lyrics are in an autobiographical style, about the bad life of the African-American population in America at the beginning 20th century. They are stories about trouble with women or work like no money, no drinks, no job, often containing more or less hidden metaphors and ambiguities, some of them are aggressive against women or contain hidden sexual innuendos. But before judging over it, consider the living conditions of the African-American people at that time. Life wasn’t easy those days. Equality of rights simply didn’t exist. The census from 1920 resulted in a total U.S. population of 105,710,620, and a Black population of 10,463,131 (9.9%) [source]. But in the Delta over 90% of all people were Black. Although slavery had been abolished according to the 13th amendment of the U.S. Constitution, ratified in 1865, most African-American people still struggled in grinding poverty as agricultural, domestic and menial laborers. Many were sharecroppers like before. Founded in 1867 the Ku Klux Klan became a power in the South and beyond, employed lynching, cross burnings and other forms of terrorism, violence and intimidation. The Jim Crow era saw the cruelest wave of “racial” hatred. Between 1890 and 1940, millions of African Americans were disenfranchised, killed, brutalized, even discouraged from learning. They really did suffer, nowadays it’s beyond belief how these things could happen. But the Blues tells the story about. You can even go deeper into the lyrics and do some linguistic research. The meter often used within blues lyrics is iambic trochaic, which is is marked by an unstressed point followed by a stressed point proceeded by two unstressed points and ensuing that would be another stressed point. And there’s even more to discover. Even Blues purist John Mayall made some mistakes when composing Blues, “Saw Mill Gulch Road” has some strange metrics (acc. to A. M. Dauer). I’ve got so many women, that I don’t know what to do. Wednesday’s even worse; Thursday’s awful sad. uses A-B-B to make the response more important. You see that the Blues can be everything from simple to complex. There are rules, but one of them is you’re allowed to brake the rules. To call attention to the audience that you start to play, a Blues song typically starts with an intro like (in E). A turnaround is often played as the last bar (V) of a blues progression. It’s a kind of transition back to the tonic (I), where the next verse starts. You can find several turnarounds if you go through the albums discussed here. Many turnarounds are similar to the intro. To summarize the song structure: Intro – 1st verse – turnaround – 2nd verse (or solo) – turnaround – etc. – ending. Chords are at the chord generator. There are different types of shuffle rhythms. The two most common forms are the Chicago shuffle, with the bass drum on the second and fourth beat like 1-2-3-4 and the Texas shuffle (double shuffle) emphasizing the first and third beat like 1-2-3-4. Examples for the Chicago shuffle are Key To The Highway or Sweet Home Chicago and for the Texas shuffle Reconsider Baby, Crossroads (Cream version) or Everyday I Have The Blues. If you ask a drummer be prepared for a long discussion. If any. Another often used of Blues rhythm is the Slow Blues. The name is pretty self explanatory, examples are Double Trouble or The Sky Is Crying. Some players tend to fill the space in these songs with ultra speed licks, but that’s a bad habit. Sometimes a fast run works great, but running through the fretboard to fill the gaps – no, never. Sometimes other rhythms are used for Blues rock (play the riffs faster without the shuffle feel and you’ll get Chuck Berry style), but the 12 bar form remains the same. If you have a Blues in A, use A string (I), D string (IV) and E string (V). Pretty simple! You may also use the chords above, but playing just chords is a little bit boring after a while, so try some riffs (a riff is a sequence of repeated chords or notes). These riffs can be played with your thumb or with a pick. They sound better when you mute the strings a little bit (using the palm of or hand or your fingers), don’t let them ring out. This is a basic riff in E (remember the sequence! ), playing notes from the E and E6 chords. This gives a better sound than just the notes from one chord. Use your pinky to get the 6! This last riff can be used on different string for scales which don’t have open bass strings. Just shift it to the right position on the fretboard and play! What song – what chords – what scale? Below you’ll find a standard 12 bar Blues shuffle (100 bpm) in different keys. You can download and use it as you like – no copyright. Download all backing tracks (zipped) here.